Our employer partners want your leadership, teamwork, dedication, ability to learn, and the the many other qualities that you bring to their workplaces. More importantly, they want to place you into the role that makes best use of your ﻿unique﻿ talents. While your military assignment is important input, it should not limit which jobs you should be considered for. Our employer partners know that your future success is determined more by your aptitude than by your MOS, and they are committed to investing in your future. How do employers get this important information? Your first step is to complete our 15-minute aptitude assessment. This survey measures your natural aptitude and suitability for jobs that our partner employers are looking to fill. 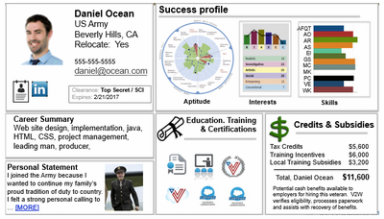 Your resulting Success Profile allows us to present your most valuable talents to employers who value what's unique to you--and are willing to invest in that potential. Register to complete your Success Profile. 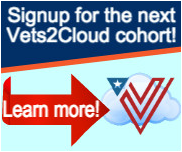 By registering you will also join a community of thousands of organizations an fellow veterans dedicated to helping you land a great job and grow your civilian career PLUS access to free related services (below). Career Assessment. Discover your best career options; understand and communicate your natural strengths to employers. Resume preparation. On-line tools to help you craft a resume that gets you noticed. Job Boards. Military-focused and other major national job boards. Veteran-preferred Jobs. Listings of jobs with a veterans-first preference. Enhanced Career Assessment. Additional tools and personalized guidance to help you understand and effectively communicate your natural strengths to employers who will most appreciate them. Veteran-preferred Jobs. Non-public, veteran-preferred jobs posted by our employer partners for your exclusive consideration. Career Launch Programs. For qualified On-Ramp graduates, with the goal of placing you into a job. The 12-week program consists of formal training, hands-on application general business orientation, workplace learning and personalized support. See Cloud Computing Career Launch Program example. Job Networking, Matching & Placement. Our assessment technology identifies your civilian-relevant strengths, regardless of prior experience. We use this information to "sell" you to employers. Internships & Workplace Learning. Together with our corporate partners, we offer a variety of experience-building, short term-assignments and paid internships designed to help you qualify for, and land, a fully-paid position. Career Development. Individual mentoring and career networking based on your interests and goals. Business Essentials. On-line tutorials to help you navigate the job search and business world. Career Portal. Comprehensive resources to discover and launch your post-military career.